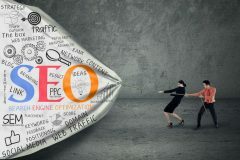 A search engine optimization or SEO strategy that gets the highest possible ranking on Google or Bing is one way to stand out in a crowded marketplace. Even a simple presence on the Web is something that you can tweak to resonate with the consumers that you want as members. The Search Engine Journal Website had an excellent post about boosting the search visibility of restaurants; I want to sum that up for gym businesses because what applies there also works in the fitness industry too, but first, a little background. The world is now a fire hose of data streaming out onto the Internet. Companies like Google index the digital presence of your fitness center, whether you really want them to or not. If you don’t practice SEO your entry in search rankings is likely to be many pages down, undiscovered by the consumers who are looking for the very thing that you offer. One solution that will get you discovered is paid advertising. Yes, the Yellow Pages may still hold some value because you operate a local consumer business, but you can also purchase digital advertising that is highly targeted to the marketplace you wish to pursue. The problem with that is that you have to have an advertising budget to cover the cost. You may decide that advertising is worth the investment, but don’t leave free promotional methods sitting on the table. The principles of SEO can give you quite a boost; paid advertising is extra on top when you can afford it. Decide what you want to achieve with SEO – Set your goals and strategy to focus on supporting your business model and which promotes the services you provide to your membership. If you have a studio for yoga or spinning classes which are instructor-led, you are going to focus on different things than if you have a weight room or a large facility or brand that covers many different approaches to fitness. Gather all the keyword terms – Define the terms that you intend to use, words that you think potential gym members will use to search for the type of services, fitness regimen, and equipment that you offer. Prioritize these as the ones you want as general keyword phrases for search, niche terms to add to pages and posts, and then the rest to add to blogs and social postings as keyword tags and hashtags. Create a consistent strategy – Your strategy should focus on local contacts as, like most health clubs, you are going to acquire members from a local catchment area within your community. Include local place names as tags and keywords in your content. Also, reach out to directories and sites like Yelp.com that aggregate reviews geographically. Encourage and invite reviews and testimonials – Building on top of your strategy, make it a part of your mission to encourage your membership to speak out on social media and review sights. All the reviews you can get are helpful to your cause whether they are good bad or indifferent. Pro Tip – Bad reviews give you feedback and a chance to turn the tables with an outstanding response. Good reviews mean time to celebrate, of course, but even neutral mentions still get noticed for SEO. Develop a process to publish high-quality content regularly – The one thing that search engines love the most is content. What is content? It’s anything that you add to your digital presence. The best content is anything that gets the attention of other entities on the Internet. Any link back from readers or comments on your postings will raise your profile in search. Pro Tip – Companies that provide search listings are self-interested: The goal of search engines is to attract consumers to them, and so what works best to make people happy is what will score highest in current search algorithms. Coordinate your site with your social media accounts – When you post to your blog, have a news item about your gym, or you have an event to announce, make it a practice to schedule social media posts that link to the article. You get the message out to potential new members, and the link can boost your ranking too. I like to think that I practice what I preach here at Gym Insight. The Gym Insight Blog is the effort of the creators of insight to remain relevant and to get found on search. We use an informative website to sell our goods and services, and the blog. Perhaps I’m bragging, but the content we publish here ranks well in search for a broad range of terms. It has been hard work, but it shows that, as a small gym business owner, you can boost your search engine results too. Aland, Maggie. What is a SERP? How Google Search Engine Works. October 16, 2016. http://fitsmallbusiness.com/what-is-a-serp-how-google-search-works/ (accessed August 24, 2017). Morris, Corey. 9 Quick Restaurant SEO Tips to Boost Your Google Search Visibility. August 22, 2017. https://www.searchenginejournal.com/restaurant-seo-tips/208644/ (accessed August 24, 2017).